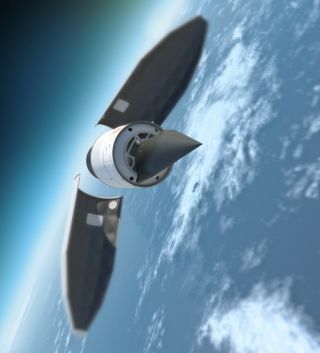 The Falcon hypersonic HTV-2 aircraft emerges from its payload fairing before gliding back to Earth. The U.S. military released new details today (Aug. 25) about the recent test flight of a super-fast prototype aircraft, along with a video showing the vehicle streaking through the sky at more than 20 times the speed of sound. The shaky, minute-long video was taken with a handheld camera aboard a tracking vessel in the Pacific Ocean. It shows the unmanned Falcon Hypersonic Technology Vehicle 2 (HTV-2), billed as the fastest aircraft ever built, blazing bright in the sky on its way to an ocean splashdown. The HTV-2 suffered an anomaly shortly after its Aug. 11 launch from Vandenberg Air Force Base in California, guiding itself into the Pacific sooner than military officials had hoped. DARPA gathered a wealth of data about the flight, but officials said they feel particularly lucky to have the video. "We were fortunate to also obtain handheld camera footage of the HTV-2 flight," DARPA director Regina Dugan said in a statement. "It gives us a visceral feel for what it means to fly at Mach 20." The vehicle launches on a rocket. It then comes zipping back to Earth at enormous speeds, at times heating up to temperatures of nearly 3,500 degrees Fahrenheit (1,927 degrees Celsius). During its Aug. 11 demo flight, the HTV-2 appeared to separate cleanly from its Minotaur IV launch vehicle, officials announced today. Further, premilinary analysis indicates that the rocket delivered the HTV-2 to its preprogrammed release point at the right speed and orientation. This is not an easy task, according to officials. "What the Minotaur IV did was make a three-point shot from the California coastline into a basket between California and Hawaii," said Air Force Maj. Chris Schulz, HTV-2 program manager. More than 20 air, land, sea and space data collection systems tracked the HTV-2 during the test flight, officials said. Scientists are still working through all of the information gathered. But they've already made some interesting preliminary discoveries. For example, initial assessments seem to indicate that pre-flight models predicted quite accurately when during the flight the HTV-2 would experience its highest drag and heat loads, officials said. "If this information proves true upon further analysis, we’ll have a better understanding of overall system capability and flight dynamics — how far it can fly with more accuracy," Dugan said. The Aug. 11 test flight was the second for the HTV-2. The first test took place in April 2010. That flight lasted about nine minutes, also ending when the aircraft detected an anomaly and crashed itself into the ocean.